When re-attaching the Lightning connector cable, be extra sure that it’s really well-connected. This connector doesn’t make a very firm attachment, and it can even be partially connected. I finished this repair, put everything back together, and the home button was not working. I was convinced I had damaged the home button flex cable, and it looked like my wife was going to be consigned to using the AssistiveTouch virtual home button for the rest of the phone’s life. In the end, it turned out that THIS cable was not firmly attached… yet other functions such as battery charging were still working. Did a better job connecting it, and the home button with TouchID came back to life. Since the positioning of the cable governs how it connects to its port, and the cable sticks to the surface below it with adhesive, you may need to gently pull the cable back up, and make sure it’s pressed back down in just the right spot to get a firm connection to the cable port. I found that this was tough to remove without accidental tear. If you’re wanting to reuse this part I suggest heating the back of the iPhone towards the bottom to loosen the adhesive. An iOpener works just fine. What ever you do don't repeat my mistake! 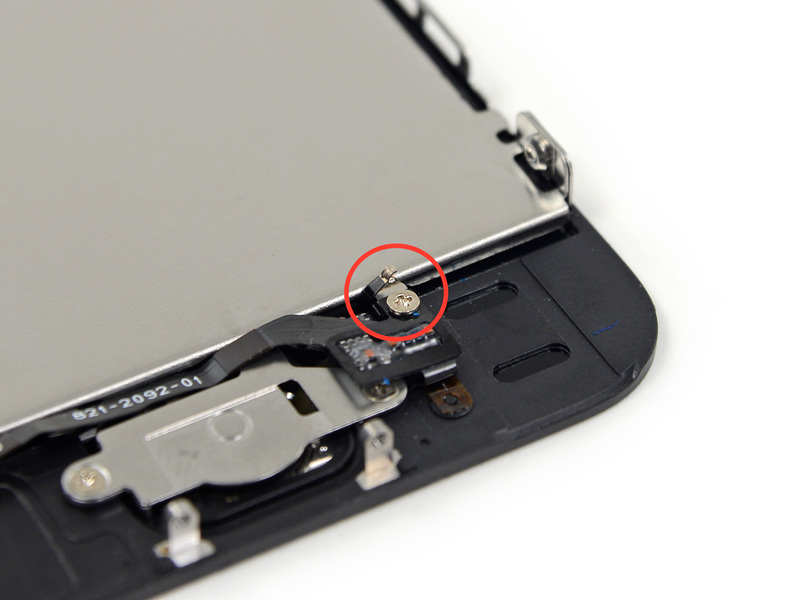 The current microphone rubber cover needs to be removed and installed on the new microphone before installation into the phone. The new microphone comes with adhesive with a plastic pell off covering that must be removed before installing the rubber cover. This step is missing from the ifixit.com instructions! I reinstalled it without removing the plastic covering and my wife's microphone was totally worthless. Once removed and rubber cover reinstalled the phone works perfectly! Really appreciate ifixit, has saved me and my family thousands of dollars over the years. Thanks foro this post. I would have missed it! The first two can be carefully cannibalized from the broken one, and the third must be carefully removed from the broken one and refitted onto the new one. Take great care in doing this! It's a bummer iFixit doesn't provide any instructions for these steps! When I did this just last night, I compared the bad lightning connector setup with the new one from iFixit, and noticed that the new one doesn't have the small metal bracket that holds the connector for the home button/fingerprint scanner in place. This bracket is right under that connector and is what the metal cover in step 8 connects to. These instructions are so detailed everywhere else, that I was surprised that this wasn't mentioned. So be careful to remove the bracket from the old connector, and put it back in the phone during reassembly. I did not need the adhesive to hold the wires, because the little cover you remove in step 8 will hold things in place. I also noticed the missing tape on the antenna wire, and the missing mic cover, and transferred them to the new connector as well. The guide is absolutely perfect right up to this point. But, when it comes time to put the new part in, it completely falls apart. There are 3 components that must be switched over from your existing Lightning Connector assembly. THERE IS NO MENTION WHATSOEVER of this at all. Worse yet, I tried to submit an additional step detailing exactly what you need to swap over and where the component go, compete with closeup photos, but it was denied without explanation. I really think iFixit dropped the ball big time on this one. I'm an auto technician by trade so this setback was not an issue for me, but I have a feeling many customers will be completely confused when they reach the end of this guide as it's written. - A thin stip that goes along the left and top edges of the headphone jack. - The bracket that holds the connector into which the Touch ID cable plugs. - The rubber microphone cover. 1) The rubber mic cover pulls off easily. Expose the adhesive on the bottom of the new mic, and slide it into the slit in the rubber cover. To reassemble, this bends 90-deg to align the holes in the rubber cover w/the small pegs on the body of the phone. 2) The "home button bracket" : remove it & pay attention to orientation & how the home button connector bends back on itself. The original bracket has some adhesive/foam to keep the connector in place. The replacement does not have this, so there's no easy way to set the button connector for reassembly - it kind of flails around. 3) I missed the comments about the headphone jack metal grounding strip until after I'd already closed up my phone. My standard iPhone headphones still work fine w/o it, but if you leave it out you could presumably wind up w/buzzing or static. This step took me the longest because nothing explained that the little connector, seen on the lower far right in the second picture, is only attached via adhesive and can easily be pried apart. Pour reassembler commencer par le jack des écouteurs. Ajuster la partie mobile avec l’ensemble en mettant la vis du bas à gauche. Positionner en place et visser sans serrer. Insérer la prise mâle de vos écouteurs dans le jack. Une fois l’ecouteur branché la pièce est correctement alignée pour mettre la vis du haut (toujours côté jack). Positionner le support du connecteur touchid. Rabattez la partie mobile, placer la vis du haut et vissez sans serrer. Positionner la prise lightning et insérer un câble lightning. Une fois bien branché tout est aligné pour les deux dernières vis. Placez vos vis et serrez. Branchez la nappe à la carte mère. Une fois qu’elle est branchée, soulevez délicatement la nappe. Décollez le plastique rouge et bleu, pour libérer l’adhésif. Pressez la nappe en vous assurant qu’elle reste connectée. where can i buy the bracket and washer? The Bracket, the Washer, the home button bracket, and very important: the rubber casing of the microphone (left of the lightning connector)! Indeed. Thank you for your precise advice. if that bracket is not put back in will the phone still work?? What is the function of the bracket? This guide left a lot of stuff out. If I had not studied the part I was replacing, I would have never known to pull some of the part off the old part and replace on the new. Works well all they way until the end. The instructions for installing the replacement lightning assembly are worthless, because the new assembly looks different and requires at least one, but probably really two, additional parts (luckily I had already ordered these in anticipation). You need to order for sure order the iPhone 5s Headphone Jack Interconnect cable (item 124027-1) and very likely the iPhone 5s Microphone Gasket (item 124047-1), because the new 5s Lightning Connector and Headphone Jack / New / Black (item 124010-1) doesnt' have the interconnect cable (and the old assembly had this molded in, so it is not removable) and the microphone has glue on the back of the flex cable, so it is likely not easily removable from the old microphone gasket (I didn't even try) and it is better to insert it in a new one. Also, as mentioned by others, several other parts (tape and a metal clip assembly) have to be recovered from the old assembly and reused. Non of this is mentioned (or photographed) in any of the instructions and it takes some review of the old assembly on how to make the new one to look the same. Just a note, the assembly of the Lightning Connector and Headphone Jack / New / Black assembly with the Headphone Jack Interconnect Cable, will look different from the original assembly, but is functionally the same (and you can tell). This was very frustrating, but the other parts of the instructions are very very good! Block out a full hour for this. It’s not overly difficult, but it takes some time to make sure everything is seated correctly as you press the new connetor into place. I found that temporarily re-installing some of the screws for placement helped get everything in the right spot before pressing the adhesive down. 349 andere personen hebben deze handleiding voltooid. After finishing my phone: shows charging but doesn't actually charge. What's wrong? I have this same issue, I've retraced my steps but can't see what I could've done wrong. Just finished this project and it took me about 1.5 to 2 hours from start to finish. Here are a few things to lookout for. 1. the antenna connecting node on your new lighting blot assembly is pretty low quality as mine popped off at some point and was gone forever. I now only have half the phones antenna in use... this makes me sad. 2. You will need to use the old, original rubber housing for your microphone as the new new lighting blot assembly does not came with it. 3. You will need to use the original "home button to lighting blot assembly" housing as the new new lighting blot assembly does not came with it. That being said, this was the absolutely first time I have ever opened any electronic device ever and I still have a somewhat working iphone aside form the antenna issue. If I can do this, anyone who knows how to take their time and read can do this no problem. great write up. was able to follow through to the end. phone still works, and i can finally charge it. don't rush and you'll be fine. I would not call this a "moderate" fix on the difficulty scale. Three hours of frustration and a minor meltdown, though I was successful in the end. I need a drink. After 6 hours of futzing around, it is done. And I can charge my phone again... But I just want to point out that an operation that literally takes out almost every component in the phone, then puts it all back in again is more than "moderate difficulty". It's difficult. There doesn't seem to be much more out there that's worse than this procedure, as far as invasiveness is concerned. Got caught up with things not fitting properly while putting back together. Just remember: don't force anything. Just keep looking to see what's caught or if you've got it slightly improperly positioned. Thank you to iFixit for the guide and the replacement part! Despite a few little missing details (now specified in the Step comments), the guide was very useful, took me like 2 hours. To explain the situation a bit, my iPhone 5S got suddenly in Searching mode. I only realized it the morning after when I got to work. I didn't drop my phone overnight or anything. Only thing in mind, I plugged it on my charger... The day after, WiFi and everything else was working fine. When I took the SIM card out... The phone stayed in Searching mode. Like any other phone, it got drop a few times and had a few bruises. Although, that sudden malfunction was surprising and frustrating. Changed the connector, reinstalled everything and I am happy to say that IT WORKS!! Where you able to solve it? I have the same problem! Es ist nicht notwendig dass Logic Board zu entfernen. Es geht auch ohne. Mich hat das entfernen des Boards zusätzlich 100€ gekostet da beim Ausbau und Einbau der Laderegler auf den Board kaputt ging und einige Filter und Kondensatoren abrissen. Da der Lautsprecher nicht mehr funktionierte musste ich die" Lightning Connector Einheit" eines iPhone 5s austauschen dazu habe ich das Ersatzteil von iFixit bestellt da es neue "Original" Apple Teile ja nur zusammen mit einer Reparatur gibt. Der austausch hat problemlos funktioniert aber nun habe ich im Haus (der Empfang ist leider bei allen 3 Deutschen Anbietern recht schlecht) gar keinen Empfang mehr (getestet mit O2, Telekom und Vodafone), davor konnte man nach etwas "Netz-suche" wenigstens in einigen Räumen Telefonieren. Gibt es bestimmte Kabelverbindungen die ich noch überprüfen kann oder ist die Qualität des Ersatzteils was die Empfangsqualität angeht leider so schlecht? I was able to follow the video and lay out my parts in a magnetic parts tray and a grid I created for each step. I noted on the paper exactly how many screws/parts were used in that step. Once I dropped the screw on the grid in the parts tray, they stayed there until reassembly. It helped me out huge! One issue I have is upon reassembly, my speaker is not working. I only get vibrate. So I had to assume that since there is no ribbon to the speaker it had to be making contact with those two contact points. I took it apart once again, and tried to re apply the charging port ribbon so that the gold contacts were exposed to the speaker module in the correct position. Any tips or tricks are appreciated. I did have one washer after all was replaced . it was not perfectly round, but rather triangular shaped. It may have been in the spot where everyone loses the bracket/washer. I will pull it apart again tonight to see. so I replaced both the battery and the lightning cable in mine, and once I completed the reassembly process completely, the phone still will not charge or boot up. It did not boot up or charge before hand, so I thought it was either the battery or the lightning port. the battery got pretty beat up during disassembly, so I ordered a new one along with a new port. the port failed a test with another battery. I have gone back multiple times to make sure the cables are connected correctly and everything, so does anyone have any idea as to what the issue is or could be? what if i dont put bracket and washer again? I've read through this guide several times and it's not clear to me why you have to remove the screen assembly in order to replace the lightning port. It's not necessary to detach the screen—just recommended in order to decrease the chance of accidental damage to the display ribbon cables. If you're careful, you can certainly open it up, disconnect the battery, and then skip straight to the speaker and Lightning connector steps. My screen is now not working, showing up vertical lines and unresponsive, I was very careful but i must of knocked somthing, any one had a similar experience or have any idea how to fix it? I’ve my iPhone 5s that discharge very fast! at least 2-3h in stan-by.. I’ve change 2 batteries and also 2 lightning connector.. it’s possible that the lighting cable is not compatible with my iPhone? Here is a very detailed video on the transferal of components from one lightning connector to another. I was completely lost at step 32 in the ifixit guide which gives no explanation as to how to transfer the bits across, until I watched this video. This Guide gave me the confidence to attempt this replacement and it was helpful but I also would not have been successful with this youtube vid. I bought the part and tools here. My 5S stopped charging so I took it to the “Genius” ?? bar and was told they couldn’t fix my phone. i was surprised because I had seen many youtube vids and this site. But I (too) quickly decided to buy a 5SE as a replacement. I had never opened a cell phone and am a 74 year old retiree. It took me days to complete the repair but am looking forward to returning the 5SE and getting a full refund because I’m within the 14 days. And, yes, I fully expect my children and friends to call me insufferable because of my constant bragging about being God’s Gift to cell phone repairs!! Took me about 1 hour, everything went perfect on iPhone SE! I didn’t have the loose spacer under the connector, but everything else was exactly as described. Amazingly everything worked when I finished. The instructions are perfect. I did somehow manage to lose the touchscreen button cable cover, but no problems so far. Thanks for the help. The main challenge to repair the Apple units is so many different screw sizes. The replacement parts is like puzzle and it is not too difficult. Thanks for the tutorial, it was really helpful. I followed the instructions and managed to replace the connector on my phone. However, as I reassembled it and started to tidy up, I found this on the carpet, and I’m afraid it belongs to my iPhone. I went back to the tutorial to see if I could manage to find out where it belongs to, with no success. Could anybody help me? @isaacnoroncaasi That’s the cover bracket for the Touch ID connector. See this step. It is 2019 and I am still using my iPhone 5s. My phone found its way into the washing machine and the microphone stopped working. After replacing it with this part it all works again!